Rhee is the last surviving member of the Ta'an dynasty and will soon be old enough to take her place as the Empress. Rhee was never intended to take the throne before her entire family died in an explosion, an explosion where Rhee was supposed to perish as well. She has spent the time between then and now plotting to murder of the man she is sure killed her family. On her way to her coronation and long-awaited revenge, Rhee is attacked by someone she knows well. After escaping she is reported to be dead and must stay on the run to keep ahead of other assassins and the person ordering her death. Publicly, her death is blamed on Aly, one of the stars of a reality show. Aly has evidence that he is innocent and that Rhee is still alive on his implanted Cube but he has to get someplace he can upload that video memory to clear his name and the people who framed him in the first place aren't making that easy. 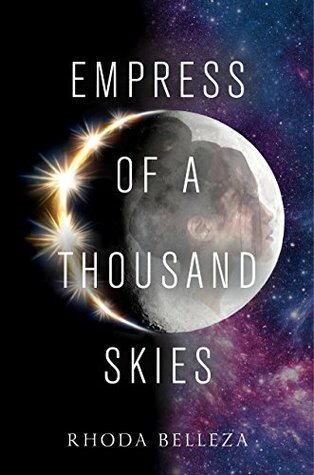 A sprawling space opera is so up my alley most of the time so I was excited to begin this book. Upon finishing, I'm still not sure how I feel about it. I was swept up at the beginning but began to question my enjoyment level about halfway through. I can't say that nothing happened but that was the point where it felt like the characters were traveling from planet to planet without moving the story forward that much. I think my bigger problem was the world building that occurred throughout the entire book. Going into sci fi and much fantasy I know that I will be confused for a couple of chapters until I get a handle on the world being created by the author. Once I get the jist of the world, I'm fine. And I want to state that I'm a big fan of show, not tell. I hate when an author has a character just conveniently say "Oh, you mean ____________" to explain things to the reader. However, this book could've actually used just a bit of that device. There were new aliens, planets, terms being introduced nearly all the way to the end so I never felt totally comfortable with the interplanetary politics or lingo. That disorientation turned me off the story. Finally, there is a reveal at the end that I felt was obvious quite a few chapters earlier. When that happens for me in a book I'm never sure if I am supposed to be surprised and am just too clever or the author not clever enough, or if maybe it wasn't really supposed to be a surprise in the first place.